Reefsleep has to be the most unique location for accommodation! While on the Reefsleep 2 day/ 1 night trip, you will experience what it feels like to go to sleep and wake up in the Great Barrier Reef's aquatic paradise with up to 30 fellow Reefsleep guests. 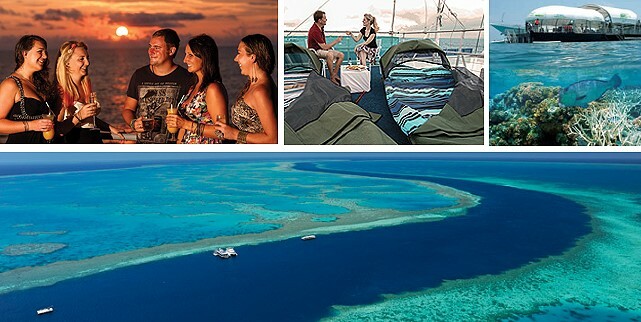 Your experience will take place at the Cruise Whitsundays' pontoon, at Hardy Reef on the Outer Great Barrier Reef. During the day, you will experience all of the pontoon activities like snorkelling, swimming, water slides and sun baking. You are also able to purchase guided snorkel tours, dives, scenic flights and massages onboard just ask the staff on the way out. And, as the sunsets, the pontoon will settle and you can enjoy the sounds of water and a few birds in the company of a handful of guests. Please note for safety reasons only children of 12 years old and over are able to join this tour. Find out why they call it the GREAT Barrier Reef with Reefsleep. The Cruise Whitsundays Reefworld pontoon has its own ecosystem with amazing corals and marine life species found only in sheltered areas. This is the perfect platform to snorkel and scuba dive! Guided snorkelling tours are available to purchase onboard with small groups. Your guide will take you to very special spots where giant Maori Wrass, coral formations, tropical fish, turtles and reef sharks are there to be seen. You can also enjoy the sights from the comfort of a semi submersible or viewing chamber. Experience your first scuba dive at the outer Great Barrier Reef, no experience necessary. Experienced divers can enjoy spectacular dives at specially selected sites with a variety of coral formations and marine life. Intro and cert dives are all booked and paid for onboard the boat, please see staff on ferry ride out. Another bonus of the Reefsleep tour for the certified divers is the rare chance to do a night dive, these must be pre-booked at time of tour booking to make sure don't miss out. You will sleep under the stars in a swag, which resembles a cosy low tent with a clear viewing panel above your head. You will be provided with a comfortable mattress and sleeping bag so you just need to bring something to sleep in. Being 40 nautical miles from the shore you are safe from bugs and mosquitos so you can sleep with the cover open. Just you, the sea air and the stars so a true camping experience.